When you are someone you know ends up in prison, the main thing that gets worried about is how will you communicate with them and when they can visit them. We know this time is a very trying time for everyone involved. It comes with a lot of changes, a lot of tears, and does not always come easy for people. That is why we made our very own prison visitation guide. Before you go off on your first prison visit, there are things that need to be done. Nearly all prisons and jails, it does not matter if they are federal, state, city or county, they typically have a inmate visiting form. This inmate visiting form is what inmates fill out on their first day of being behind bars. However, some prisons and jails may request more information. Make sure that they know this information, so they can add you to the list. Some jails and prisons may ask you to fill out a visiting application, so you will want to inquire about that before you head on down to the prison. Not anyone can visit inmates in prisons. They don’t just have rules on when you can visit, but they also have rules on who can and who cannot visit too. Majority of prisons follow this guideline. These are the people who are able to visit. This doesn’t mean just because you are on the list above you will be able to see your friend or family member in jail. If you have a warrant out for your arrest, you will not be able to. If you are a felon, you will not be permitted visitation rights either. Yes! Yes, minors can visit. You will need to typically fill out a visitation form for minors. Some prisons may request you to bring their birth certificate. However, minors are not allowed to visit alone. They must always be accompanied by their legal guardian. Keep in mind that inmates who have had a history of crime against children, they will NOT be allowed to have children as visitors. You will also need to keep your children under good behavior. If they are rowdy and disturbing other guests, they may be access to leave visitation area right away. Do you work for the department of corrections? We highly recommend that you fill out these questions honestly. They will be running a background check on you, so if you do not think you should answer truthfully; they will find out one way or another. There are many reasons why your visitor application can be denied. We compiled a list of the top reasons why your application could be denied. You are a security or safety risk. The entire process from the time you submit your federal prison visitation form to the time you should hear back takes about six weeks. The process can take longer or short though. It all really depends on the time of year you place your application. It takes this long because they thoroughly look through your background. They do not want just anyone walking through their facility. Pro-tip: Most jails and prisons do not contact you directly to tell you if you are approved or denied. They instead tell the inmate. Do not wait around for a phone call or a letter in the mail telling you what your outcome is. Keep in touch with the inmate. They will be able to tell you your status. After you get your approval. You are going to need to check with the prison or jail about their visitation hours. Most prisons have their hours for visitation on their website. If they do not have their hours posts on their website, I would give them a call. You will always want to double and triple check to make sure the hours are correct before you head out. You also want to make sure that the visitation day has not been canceled. Visitation can with canceled at any given time without notice. Most of the times when visitation is canceled is when the prison or jail is on lockdown. Lockdown is when the prisoners are essentially grounded from having any of their privileges such as mail, visitation, and yard time. If the person you are visiting is in solitary confinement or what they call ‘the hole’, they lose any and all privileges including visitation. Once you are sure about the visitation hours and the visitation is still on. You will need to make sure you have the proper identification with you. The proper identification you will need is usually just a government-issued ID. Nothing fancy. Everyone has one. Your license will do. If you do not have a license, you will need to go down and get your government identification card. Dressing to visit the prison is one vital part of this entire process. If you dress inappropriately, you will be denied you visitation right. You do not want this. Here is the general layout of what the dress code is like in nearly all prisons and jails through the United States. Steer clear of any clothing that looks similar to inmates or prison staff clothes. Essentially, dress business casual. Just like you are going to interview for a job. If you show up in any clothing from above, you can and will be denied, and you will lose your chance to visit that day. That is something that can be easily prevented. Do not make this mistake. Once you arrive to the prison, there will be a few things you have to do before you get to visit. How to visit a prison inmate is kind of a lengthy process, so many hoops to jump through just to get to be able to walk into the prison. But all of these procedures are to make it completely safe for you and them. You should always arrive about 15-20 minutes before your scheduled visit. This should give you more than enough time to fill out any paperwork, go through security checks, and just get into the waiting area. Many prisons will not let you in, if you arrive late. However, some will. If you arrive late, just know that your visit will not be the full length that it was expected. When entering the prison grounds, expect everyone and your automobile to be searched. You may be asked to take off any jewelry, belts, and empty your pockets. You are not allowed to take many things into the visitation room. You really are only allowed to take in the clothes on your back. But here is what most prison will let you take in to the visitation room. Yes! That is, it. And even that stuff can in a gray area, so you will want to leave anything else you may have on your person such as your purse, wallets in your automobile. What Your Visit Will Look Like? Once you are brought back to the visiting area, it is vital that you keep in mind, this visitation is closely monitored. What may have been acceptable at your home or during visits with them prior to jail, may not be acceptable for in jail visitation. Remember you will need to keep a professional demeanor when visiting. You should also keep in mind, that you are not the only one in this visitation room. You will want to respect the others visiting and keeping your voice to an inside voice and keep calm. If you keep disturbing the others around, prison staff can and will cut your visit early. 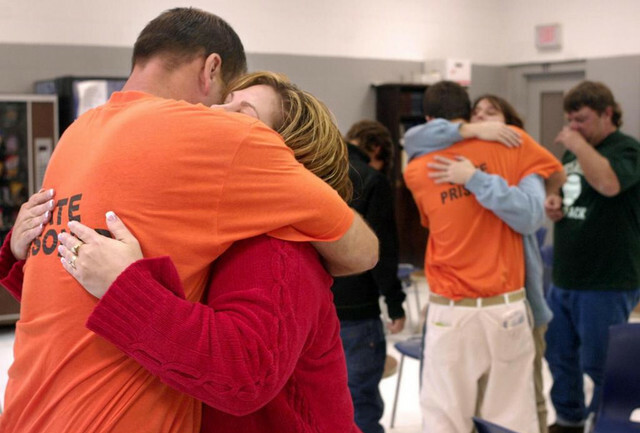 You will be able to give your inmate a handshake, kiss or a hug at the beginning and end of your visit. Nothing more. During your visit, you will not be allowed to touch at all. This is for security reasons. If you cannot comply prison staff will ask you to leave. With technology advancing every day, there are some prisons starting up internet video visitation centers. These visitations are a blessing for those who do not have family locally. It cuts a lot of the process out too. Not to mention, it tends to be a lot safer for all of those involved. You will have to contact the prison to see if they offer internet video visitation for you to take advantage of instead of the traditional onsite visitation.